Amurin puutalokortteleiden rakentaminen alkoi 1860-luvulla Tampereen kasvavan työväestön tarpeisiin. Näistä kortteleista on jäljellä vain Amurin työläismuseokortteli, johon kuuluu viisi alkuperäisillä paikoilla olevaa asuinrakennusta sekä neljä piharakennusta. Asuinrakennuksiin on sisustettu asuntoja, jotka ajoittuvat vuosien 1882 ja 1973 välille. Museoalueelta löytyvät myös yleinen sauna, leipomo, suutarinverstas, osuuskauppa sekä paperi- ja lyhyttavarakauppa. Tampere was founded in 1779 on a narrow isthmus on the western side of the rapids. The burghers that moved into the city were given plantation land for cultivation and pasture on the western edge of the city. Strong industrialisation brought new inhabitants to the city from the mid-19th century onwards, and the city needed plotland to accommodate new people. The only possible direction to enlarge the city was towards the west and thus the burghers had to part with their plantation land. At the same time Finnish immigrants were travelling towards Amur Land in Siberia. Tampere people thought that the new district was located far from the city centre and it became to be called metaphorically as Amurinmaa, Amur Land. The name took the form of Amuri. Amuri grew together with the industrialisation of the banks of the Tammerkoski rapids. By the beginning of the 20th century Amuri had five thousand inhabitants. 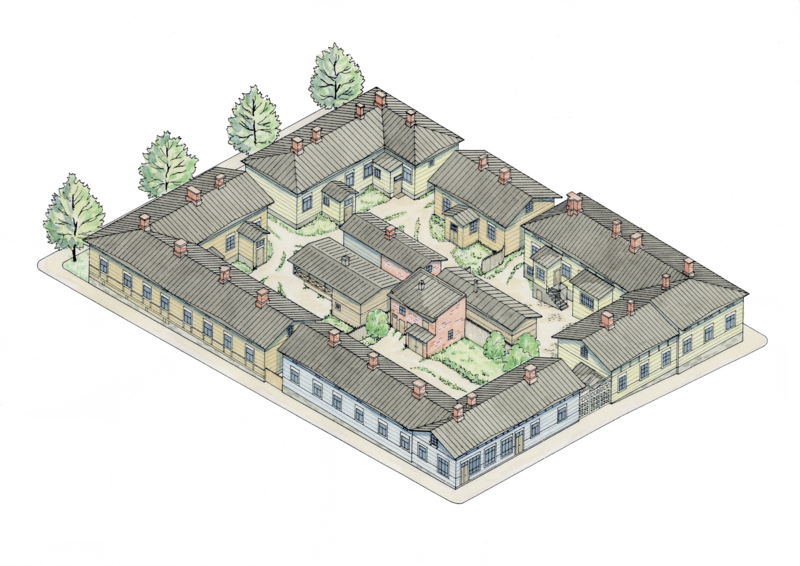 The communal kitchen system was a special feature of Amuri district’s houses. A typical communal kitchen ran through the house vertically, and it was surrounded by two rooms on both sides. The community around the kitchen thus included four families with their subtenants. A houseowner had typically two or three bedrooms and a private kitchen. One of the outbuildings had outhouses on top of the stairs in one or two rows. Many outbuildings also had a stable. Amuri had several communal saunas. People went to the centre of the city only for special errands, all the necessary things could be bought from the areas merchants or Mustalahti market. During the 1950s, H&auml;meen Museoseura society had an idea that Tampere should have an open-air museum. 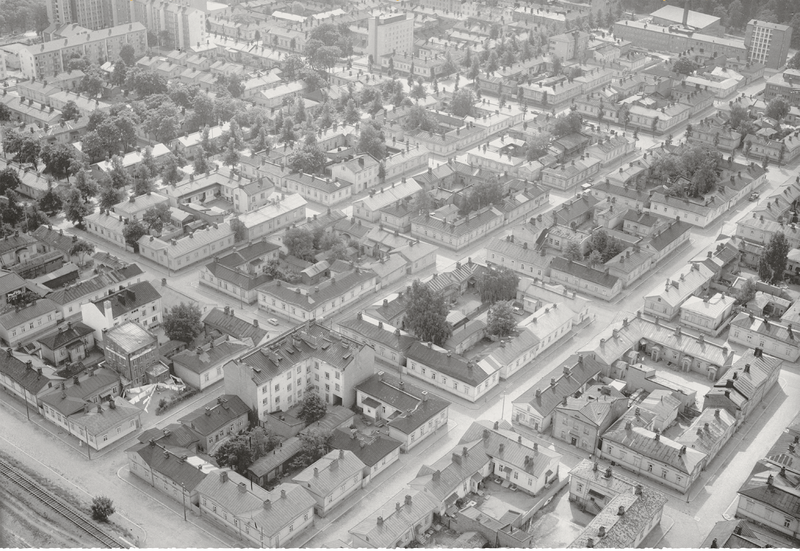 In the first phase the museum was planned to be located in the district of Ratina, and the idea was to relocate buildings from different parts of Tampere there. The idea had developed into a workers’ home museum by the 1960s. New town plan was drawn for Amuri in 1965 and in it the city reserved one block for museum use. The society set in 1967 a committee to develop a museum plan. When Tampere Museums was founded in 1969, the task was appointed to them. The first phase in turning the block into a museum was when the Cooperative Store i.1. museum was opened in the block in 1975. Kulutusosuuskuntien Keskusliitto Cooperative Organisation had donated merchant ware and artefacts to the City of Tampere. Their wish was that the museum would be opened in 1975 when Osuusliike Voima Cooperative Store and the whole E-osuuskauppaliike Corporation celebrated their 75th anniversary. The leading thought of the museum planning was to describe the living and the lives of Amuri people from the founding of the district to the 1970s. The dwellings should look like the inhabitants had stepped out of them only for a moment. Inhabitants were created to each museum dwelling, and they were general descriptions of Amuri people. Names, professions, family sizes, etc. were searched from records. Information for interior décor was gained from estate inventory deeds, literature, and interviews were conducted. The artefacts in the rooms are mainly from Tampere and Tampere Region, partly also from Amuri. The only authentic dwelling is the one from 1973. The residential building of Makasiininkatu street 12, where the Cooperative Store i.l. museum was located, was finished for museum use in January 1980. The dwellings of the building date from 1932 to 1973. The building also houses a haberdashery from 1946. 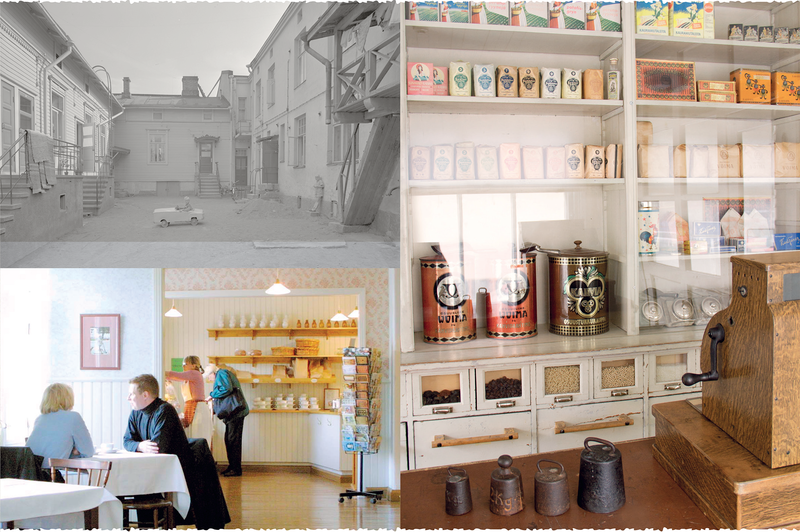 The cooperative store was connected through storekeeper’s dwelling to the rest of the museum. In the days preceding midsummer of 1982 the public gained access to plot 41’s residential building. It houses dwellings from 1911 to 1939 as well as a bakery from the 1930s. Previously the museum had been open yearly only on Tampere Day but from there on the two finished museum buildings were open for public during summer season. In 1975 architect Matti Huusari drew in the city’s architectural department a communal sauna and used the saunas in Amuri and Pispala districts as a model. The sauna was completed on plot 43 in 1991. At that time the so-called small house, located on the same plot, was opened which houses dwellings from 1901 to 1909 as well as a cobbler’s shop. In 1992 the larger residential building on the same plot was finished for museum use and it houses dwellings from 1882 to 1899 as well as two playrooms with traditional toys for younger visitors. The main principle when the buildings were turned into a museum was to conduct as little renovation as possible as well as using professionals who had the same skills as the carpenters, painters and masons in the olden days had. The fifth residential building of the museum was planned to be taken into museum use, for example, as an author museum. In the end a decision was made to found a café and a space for changing exhibitions in the building. The first coffees were served in 1995.